Of the senses, vision is the most important for safe flight. However, various terrain features and atmospheric conditions can create optical illusions. These illusions are primarily associated with landing. Since pilots must transition from reliance on instruments to visual cues outside the flight deck for landing at the end of an instrument approach, it is imperative that they be aware of the potential problems associated with these illusions and take appropriate corrective action. The major illusions leading to landing errors are described below. A narrower-than-usual runway can create an illusion that the aircraft is at a higher altitude than it actually is, especially when runway length-to-width relationships are comparable. [Figure 17-7] The pilot who does not recognize this illusion will fly a lower approach, with the risk of striking objects along the approach path or landing short. 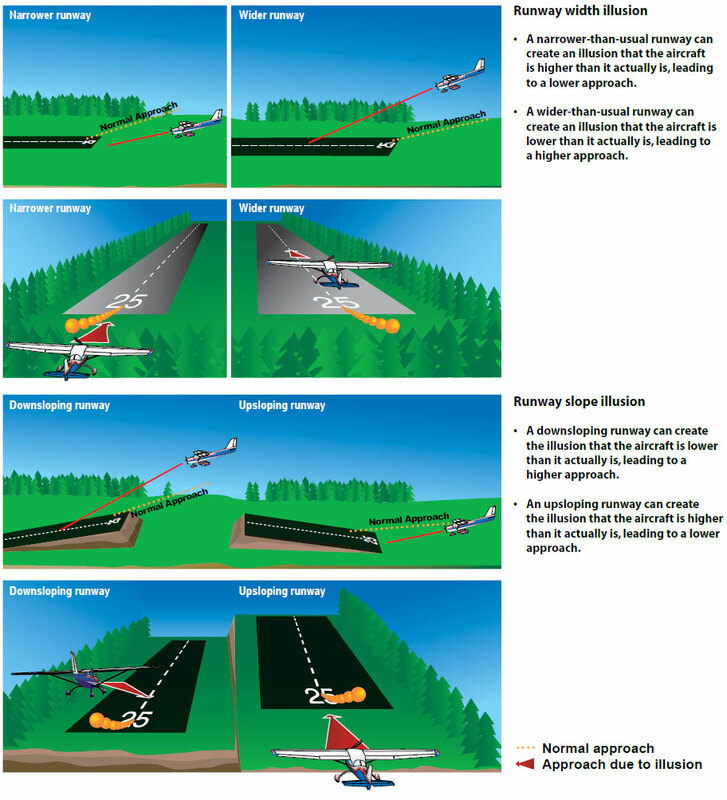 A wider-than-usual runway can have the opposite effect with the risk of the pilot leveling out the aircraft high and landing hard or overshooting the runway. An upsloping runway, upsloping terrain, or both can create an illusion that the aircraft is at a higher altitude than it actually is. [Figure 17-7] The pilot who does not recognize this illusion will fly a lower approach. Downsloping runways and downsloping approach terrain can have the opposite effect. An absence of surrounding ground features, as in an overwater approach over darkened areas or terrain made featureless by snow, can create an illusion that the aircraft is at a higher altitude than it actually is. This illusion, sometimes referred to as the “black hole approach,” causes pilots to fly a lower approach than is desired. Rain on the windscreen can create an illusion of being at a higher altitude due to the horizon appearing lower than it is. This can result in the pilot flying a lower approach. Atmospheric haze can create an illusion of being at a greater distance and height from the runway. As a result, the pilot has a tendency to be low on the approach. Conversely, extremely clear air (clear bright conditions of a high attitude airport) can give the pilot the illusion of being closer than he or she actually is, resulting in a high approach that may result in an overshoot or go around. The diffusion of light due to water particles on the windshield can adversely affect depth perception. The lights and terrain features normally used to gauge height during landing become less effective for the pilot. Flying into fog can create an illusion of pitching up. Pilots who do not recognize this illusion often steepen the approach abruptly. Lights along a straight path, such as a road or lights on moving trains, can be mistaken for runway and approach lights. Bright runway and approach lighting systems, especially where few lights illuminate the surrounding terrain, may create the illusion of less distance to the runway. The pilot who does not recognize this illusion will often fly a higher approach. Anticipate the possibility of visual illusions during approaches to unfamiliar airports, particularly at night or in adverse weather conditions. Consult airport diagrams and the Chart Supplement U.S. (formerly Airport/Facility Directory) for information on runway slope, terrain, and lighting. Make frequent reference to the altimeter, especially during all approaches, day and night. If possible, conduct an aerial visual inspection of unfamiliar airports before landing. Use Visual Approach Slope Indicator (VASI) or Precision Approach Path Indicator (PAPI) systems for a visual reference, or an electronic glideslope, whenever they are available. Utilize the visual descent point (VDP) found on many nonprecision instrument approach procedure charts. Recognize that the chances of being involved in an approach accident increase when an emergency or other activity distracts from usual procedures. Maintain optimum proficiency in landing procedures. In addition to the sensory illusions due to misleading inputs to the vestibular system, a pilot may also encounter various visual illusions during flight. Illusions rank among the most common factors cited as contributing to fatal aviation accidents. Sloping cloud formations, an obscured horizon, a dark scene spread with ground lights and stars, and certain geometric patterns of ground light can create illusions of not being aligned correctly with the actual horizon. Various surface features and atmospheric conditions encountered in landing can create illusions of being on the wrong approach path. Landing errors due to these illusions can be prevented by anticipating them during approaches, inspecting unfamiliar airports before landing, using electronic glideslope or VASI systems when available, and maintaining proficiency in landing procedures.